Behind the Bit: Non-warmbloods in dressage: A breath of fresh air! Non-warmbloods in dressage: A breath of fresh air! A year or so ago, I went to a local, unrated dressage show. I noticed a horse in the warmup ring [not the one pictured left]. The chestnut gelding was lovely--slightly built, a light mover, and maybe a little hot. His croup was a little flat, his tail was set high, and were his little sculpted ears pointed in? I almost--almost--went over to ask if he was a saddlebred. Later I found out he was by one of the top warmblood stallions in the country and out of a thoroughbred mare. Although the question should not be taken as an insult (IMHO), I am glad I kept my mouth shut! Actually, the chestnut horse seemed a whole lot cooler, and more special, when I thought he was a saddlebred. 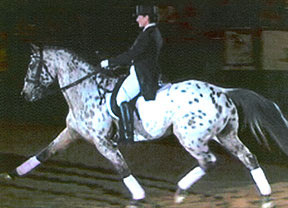 Dressage does not mean magical mystery dance, it means training -- other breeds can do this too! 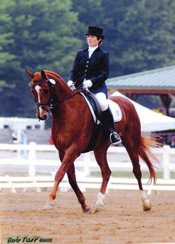 And warmbloods may be conformationally made for dressage, other breeds are competitive. 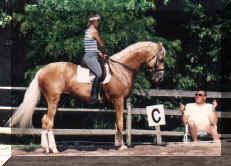 The upper left picture is a saddlebred, for example. I posted a query to the Ultimate Dressage Bulletin board and got some pictures and video links to non-warmbloods in dressage. Below is a video and picture compilation of breeds competing in dressage and doing very well, thank you! On the left is Crescendo (Lipizzan/Appaloosa) w/Sharon Rowe, 1989 GP HOY Open USDF; scored *9's* on his piaffe. On the right is Kaiser's Realm, a quarter horse and 1988 USDF GP Open 13th, also with Sharon. So niiiice to see so many non-warmbloods doing stellar dressage! I'd rather see a non-WB in the ring any day, esp OTTB's. Hey thats me and Audi in the first video! Thanks so much for including us on this very cool page! Cindi, My bad for not including your name. I just can't get over how gorgeous Audi is, and what great "dance partners" you are. Thanks for sharing that video on Youtube! I would love to see more non-warmbloods in dressage. I have two quarter horses I am working with right now, they will never make it all the way up the levels but I don't care, neither will I. I also love the warmbloods, my best horse was a 17.2 hand Dutch Warmblood imported from Holland and he was the sweetest,kindest horse I have ever known. We were partners and best friends for 15 yrs. until I lost him last April to colic. I've been told that Dressage is a partnership between horse and rider, with each striving to do their best for each other, so really what difference does it make what breed a horse is as long as you both do the best you can. I didn't want to put this in the blog--I own a young WB and have no illusions that he'll be a "cinch" to ride. But I have read some posts from trainers that lament that their amateur wb riders only like to practice the movements that come naturally to their horses, e.g., lengthenings. It must be tempting to coast a little--but they aren't really maximizing their horse. When I see non-warmbloods beyond 2nd level, it's always clear that the riders are REALLY RIDING WELL, and I suspect making the very most of their animals. Excellent, excellent post! I've been eagerly waiting for it since I read about it on COTH. I have a 3 1/2 year old Arab/Saddlebred I'm about to start under saddle, and it's great to see some role models in action. It's great to see other breeds competing in dressage and that people don't think they have to have a warmblood to compete. There's something for everyone to be learned in dressage and I think it's more likely to happen with the sport opening up to other breeds. Great to see these videos. 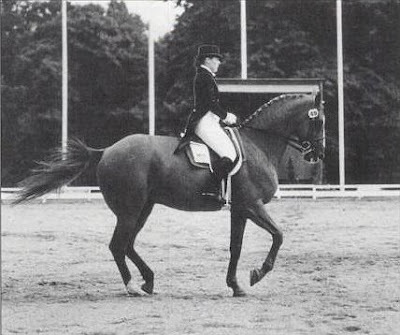 It reinforces the fact that dressage is about training and obedience, not simply about gaits. hey, (cat on arm--no caps)--what was keene? 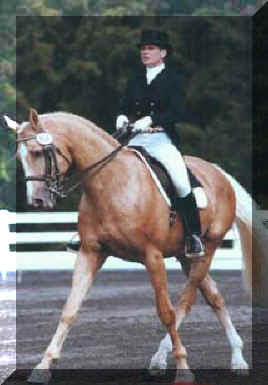 Keene was a TB, but a very warmblood-like thoroughbred. I would LOVE to see a video of him and Hilda G.
I love this! I am always looking for the non-warmblood breed in competitions. (esp American bred) I also love when people tell me 'you can't do that with this breed.' Because then I have to prove them wrong. :-) Granted, I'm not running in the exalted circles of competition, but then I'm just doing this to have fun. Several years ago I was at the Washington International, and at that time they announced the breed of the horse when they came in. Watching the Jokers Wild, we heard warmblood, warmblood, warmblood, American Quarter Horse! We all perked up, yay! An American horse! So this 18 yr old girl was smoking this course, and right before the buzzer, she jumps a fence, takes 2 strides, does a perfect rollback, and jumps back over the same fence just as the buzzer went off. We all went wild! Yeah, that's a QH! Of course she didn't win because she missed the joker fence, but she did place, and no other horse there could have done that maneuver. Typo. there is no final 'e' on Keen. No worries about not including my name. Audi is the star. Without him, I'm just another middle aged mom who likes wearing leather breeches and tall boots! Sorry I missed this post earlier. I am very happy to go out compete with the Warmbloods on my 15.1 hand Arab. My trainer rides I1 on an Anglo and has another Arab that has one of the most beautiful passages I have seen. Keep in mind I only ride First level myself but trailer has my guy schooling 3rd. It can be done. In fact in never crossed my mind that we couldnt do it. Excellent post I have a pure bred arab that i have just started competing in dressage with he is only 5 and is alot better behaved than most of the horses at these shows although many people give us a wide birth. Judges always comment on how pretty he is and how well he moves although one comment from judge was to say arabs cant do dressage - NONSENSE i say any horse can do dressage if well trained and free moving. My moms coach showed a tbd to Grand Prix, I think my Connemera will make it there one day too. Thanks for sharing. This article really makes me happy. SO many people told me I was a fool to try to convince the grade pony / school pony (aka random mix) appaloosa to do dressage, let alone compete! It wasn't easy considering I have to share once or twice a week due to the fact he is a school pony and I don't have a full lease, not to mention I'm at a Hunter/Jumper barn and there's not many higher level dressage trainers out there! All considered, two years later we go to a dressaege show, have a bad day and still competitively compete for ribbons! This is a great motivater, especially since everyone tells me "he cannot go much further" when they've been saying that for the past year or so. Great article, thank you! Here on equestrial.net more interesting information for you.